Beverly Barrett, a graduate of UT Austin with a Bachelor's of Journalism, is a freelance photojournalist whose clients include The New York Times, The Austin Chronicle, The Austin American Statesman, Rude Mechanicals, Tape Op Magazine, and Fortune Magazine. She also works for KLRU, the local PBS affiliate in Austin, Texas where she works on the television programs Austin City Limits, Austin Now, and Central Texas Gardener. 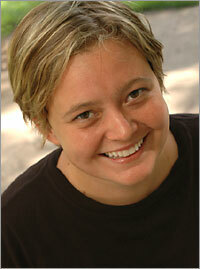 Her roles at KLRU include technical director, floor manager, and camera operator. Before graduation, Barrett interned for six months at The Albuquerque Journal where she carried out daily and longer-term assignments. Beverly likes to take pictures of her friends. People really like Beverly's pictures.